Why you want backyard chickens - and how to do it. In recent years, the scene of a small flock of chickens and a quaint coop has become the case in an increasing number of backyards. Eddington resident Allison Blokland wanted to begin raising her own flock of backyard chickens so badly that she drove seven hours to Vermont to take a class from her favorite author on the subject. Fueled by a desire to know where her food comes from, and to have the the nostalgic routine of going into her own backyard to collect fresh eggs, Blokland said she’s enjoyed her experience raising chickens. There are a host of benefits to raising backyard chickens, according to Scott DeMoranville of the Maine Poultry Connection. Having your own flock of chickens for egg or meat purposes means that you know exactly where the source of food is coming from. Chickens can also serve as a form of insect control, given that they’re known to eat pests such as ticks. Additionally, as DeMoranville and Blokland both said, their quirky personalities are an added bonus to any backyard. “I’ve had a number of people come up to me that have said chickens would be good for therapy, and it’s true. 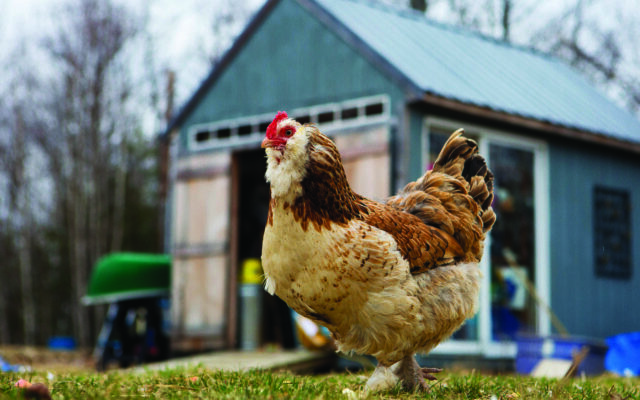 Chickens have a tremendous personality,” DeMoranville said. But to ensure that raising backyard chickens is a pleasant experience there are a few things potential poultry raisers should be aware of. First, towns and cities throughout Maine vary on the rules that regulate chickens raised in a backyard setting. DeMoranville says to check with your town or city’s code enforcement officer before making plans to raise chickens to see what the regulations that would pertain to your flock are. A good rule of thumb would also be alerting your neighbors that you plan to raise backyard chickens, as Blokland did. While in Eddington, she said there were no qualms about having a backyard flock at the town level but Blokland felt it was important for her neighbors to let her know if her chickens — especially her two roosters — were becoming a problem. When starting out with your first flock, DeMoranville said that six laying hens is a good number of chickens to start raising. This is a manageable number of chickens, he said, to get the idea of whether raising chickens is right for your family. However, with a wide range of chicken breeds available he suggests doing some research on which breed will be the right fit for your situation. While hens can be purchased at varying life stages, DeMoranville recommends raising hens from chicks. Raising the chickens from this young age is added work, but raising them from their early days allows owners to shape the conditions in which the chickens are raised. If your hens are purchased when they are still baby chicks, they must be raised indoors in a brooder until they are temperature resilient enough to be outside. A day old chick must be kept in an area that is 95 degrees for one week, decreasing five degrees each week, DeMoranville said. Once outside, the amount of space the chickens have within their coop and in their grazing yard is important. The amount of space they’re given also depends on whether you want your chickens to be free-ranged or kept inside of a fenced area during the day. Free range chickens will have as much space as they desire to graze, coming back to the coop at night to roost. On the other hand you can opt to have a fenced area around your coop where the chickens can graze during the day. Inside of the coop and out, DeMoranville suggests that each bird be given four square feet of space to ensure they are not crowded. “What I tell people is that if the bird seems cramped they probably are,” he said. Securing the coop at night, and making sure that your fenced in area is fully enclosed, will also help decrease the risk of predators harming the chickens. On a day to day basis, the chickens should have enough feed for them to graze from all day and fresh water should constantly be available for them. The chickens should be checked on daily, as well as be picked up every now and then to make sure they are a healthy weight and to check for any signs of possible health problems. As for the eggs, DeMoranville said just because you have six laying hens doesn’t mean you should expect to get six eggs everyday, realistically it will be more like four. Additionally, as hens age their egg production decreases by 30 percent annually. It’s this full-circle of raising chickens from day old baby chicks to full grown hens that lay their own eggs that makes DeMoranville so infatuated with the backyard process. “I can’t really explain it, it’s just such a gratifying feeling,” he said.